I have never owned a dog. My only claim to one, is an emotional-timeshare in Murray, who lives with my ex-housemates, in our college house in Menlo Park. My roommate wrote me one day, a few years after I had returned to Singapore, to say they were giving up their city townhouse and moving back to the suburbs. Oh and by the way, she had bought a labradoodle. That's right, a furry, ringlety, docile teddy bear of an attention-loving dog. An Obama Dog. I don't see him very often but he is the best dog I know. 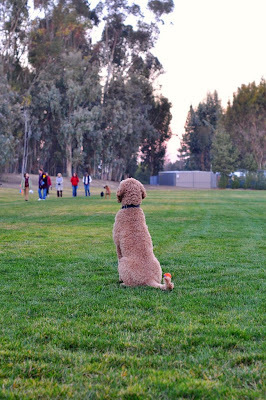 I love that he has to wear little rubber Ruffwear booties to go hiking, that he doesn't smell, that he contemplates like he's considering, before joining other dogs at a dogpark and most of all, I love that it thrills him to walk up to people and flop down on their feet, or knees, or over their stomach. 4. Refrigerate for 2 hours at least, wrapped in clingfilm. Roll out on a floured tray and stamp out shapes. Lay the biscuits on a tray and freeze for 10 minutes before baking to retain the shape. 5. Preheat oven to 180C and bake each tray for 20 minutes. The discuits (dog-biscuits) smelt amazingly appetizing and yet super healthy in the heat of the oven! 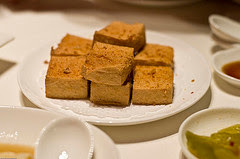 In making these treats, I used Bob's Red Mill Wholewheat Flour, natural organic peanut butter and low-fat Australian milk. I read though, that some dogs, like humans, are allergic to peanuts and some other nuts, so be careful! I took the opportunity of celebrating SW being back in Singapore to throw a popiah party! We were very fortunate to be joined by some pre-eminent food bloggers who contributed their time and effort to dinner. Here are some photos from our popiah-making efforts, some as you can see, neater and more polished than others. You might think of popiah as a very Asian thing but I actually have a lot of non-Asian friends who would rate it as one of their favourite dishes. 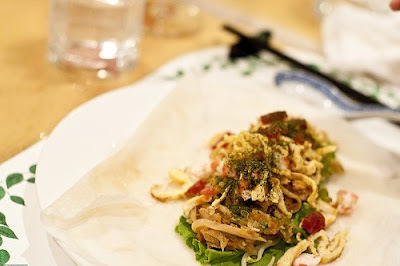 You start with a popiah skin, which is essentially a dough wrap. These skins are so thin, they are pratically translucent and making them is an art of its own. The ones I buy are from the Havelock Street Market and the store there specialises in popiah skins- it's amazing to think he makes enough profit just supplying home cooks and food hawkers around the area. The flour-based dough is very supple and soft and in one swift motion, the old man rubs it on a charcoal-heated plate and removes his hand, leaving a thin layer of dough on the pan. It's a bit like watching crepes being made, except it's not a batter and you actually have your hand dangerously close to the hot plate for a few seconds. These skins then have to be kept moist and warm awaiting dinner. To wrap a popiah, you take a skin, layer on a lettuce leaf, drizzle sweet sauce onto the leaf and then pile on some of the turnip-carrot-bean filling. Then on top of the filling, you layer your toppings of sliced egg omellete, cucumber, diced prawns, diced chinese sausage, blanched beansprouts and Z's piece de resistance, shredded fresh steamed crab. Then you add the garnishing, which tonight was ground garlic, sweet chilli sauce, fried crispy Chinese shallots, dried ground seaweed, ground roasted peanuts and crushed ground salted fish. After you've stuffed your popiah, you proceed to roll it up by folding in the edges and rolling the skin into a spring-roll shape. For some of us, it gave a new meaning to "trying to hold it together". Providing kueh pai tee cups is also a great idea- they were helpfully sold along with the popiah skins and offered a crispy way to eat the filling. After popiah, we had lean pork and century egg porridge, cooked with black chicken soup. 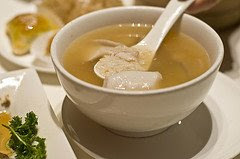 To be honest, I had a pot of black chicken soup on-hand which I had boiled with some sweet corn and Japanese mushrooms because I thought SW might be craving some home-made Asian soup but at the last minute, I felt that the porride was too thick, so I also used it to dilute the congee. I guess I didn't think of it later, but it would probably enhance the taste. I was surprised to see this so well received, who knew? 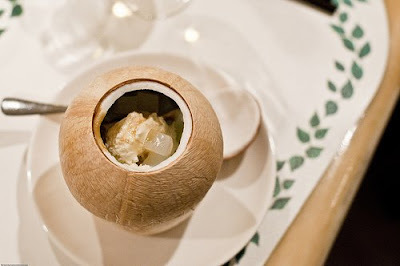 I was particularly proud of my dessert "creation", avocado cream and vanilla bean ice cream with gula meleka and nutta de coco in a young coconut. I had tasted something similar at Jing (at One Fullerton) so when S. asked for this, I thought to try my hand at making it. The recipe, which was a pure trial and error one, is half ripe, soft avocadoes to the number of guests, scraped and squeezed over with some lemon juice and blended with the water from the young coconuts. The consistency of the avocado cream should resemble real cream, or melted ice cream. I then froze the young coconuts and the avocado cream for the rest of the day and when it came time to serve, scooped out the cream into the bowl of the coconut, scooped in vanilla bean ice cream and laced it with gula meleka and nuttu de coco. The gula meleka was just chopped and boiled with warm cream, while the nuttu de coco I found conveniently cubed in a ready-pack (in original flavour) at the grocery. The dessert was definitely the highlight because we gratefully received M's home-made fudgie brownies and K's (of Mad Baker) lemon meringue tarts and salted caramel macarons. 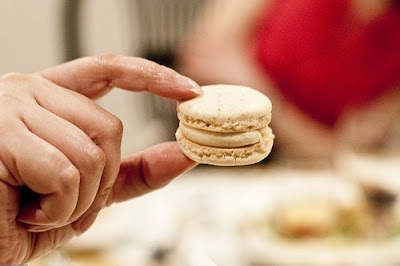 Knowing Z. and my weakness for salted caramel, she was kind enough to make us a batch of french macarons, no less. There's nothing better than good company, good food and good friends. I'm privileged to have met these people all through our love of food and fellowship. You've heard people say that a lot of work is involved in popiah...well is it? Well, it's all in the preparation because popiah is eaten, essentially, well, raw. But as the first photo shows, you must always peel your Chinese sausages. 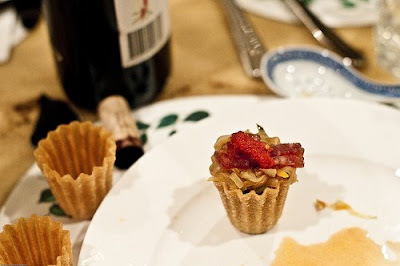 Then, you dice them into teeny tiny segments. Little even rectangles, from about 10 sausages. Oh yes, and buy the small fat ones, with lots of flavour (and fat). While you are waiting for the skins to come off (boil them, then plunge the sausages into ice-cold water), you might want to start de-seeding chillis. How many chillis? How about this many chillis? The large ones only though, the small chilli padis you can leave whole and just de-capitate their stems. Then you grind all the chillis in a blender, with a handful cloves of garlic and a large knob of ginger. Chilli is very important to popiah, it gives it a good kick. What are vegetables without a good kick, after all? Then you take a large turnip and shred it through a grater. Alternatively, you can slice it by hand. Repeat with four more turnips. Repeat with two heads of cabbage. Repeat with 10 stems of Chinese leeks. Repeat with 5 large carrots. Repeat with two cans of preserved bamboo shoots. Repeat with a dinner soup bowl of shallots. Repeat with a handful of french beans. Repeat with a large flat skin-on piece of pork shin. You are getting the idea aren't you? Fry the shallots in a shallow pool of oil, till they are soft and fragrant. Put the ingredients in a large pot and saute well, starting with the stiffer ingredients first. If you look at the carrots here carefully, you can tell that half the bowl is sauted and the other half is raw. The half on the left is sauteed, you can see they've become lighter, wetter and slightly smaller in texture. Saute all the ingredients together and continue to let the mixture cook in its own juice for an hour. Where is this all going? You'll see! It had been a long time since my last perky Japanese meal. 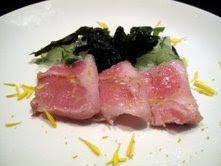 So long, that I had almost forgotten the taste of toro, instead recalling the sour taste of too much MSG, in the all too Casual with a Capital C Japanese restaurants I was frequenting. Thank God our French Kitchen dinner happened on a day when we were both chock full of western food and we thought to go Japanese. It was definitely my lucky day as we decided then to go to Tomo at Marina Square. I can live without trying overpriced French fare. We had round after round of sushi and sashimi, by the time M came, I had eaten my way through the salad and the pickles. 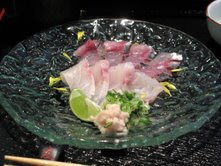 The first few rounds were sashimi of aji mackeral and hamaji. 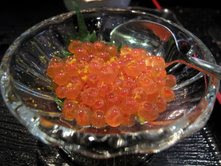 Then we had some sushi and chef was tolerant enough to feed me some freshly-made tamago. 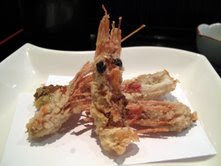 We then had tiger prawns, not wriggling, as they were in Sushi Immamura but still, sweet and fresh and with the crunchy treat of the deep fried heads and tail afterward. After awhile I forgot what I ate, I forgot to think about what I was eating. All I know is that I barrelled out of there, very happy with my eating and suddenly in love with Japanese sushi again. Of course, that might also have to do with the sweet finish of Chef's incredible yuzu and momo peach ice creams- some of the best I have tasted! Rounding up Christmas? It's almost Easter! That's what you might think but I just wanted to show one more good looking cream picture of caramelized pumpkin pie and then I'm done for this year, I swear. 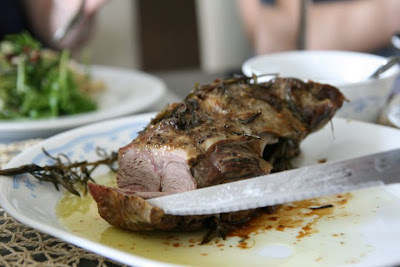 The highlight of the Christmas lunch had to be that M, our fashionable, I-don't-cook M, made a roast lamb. 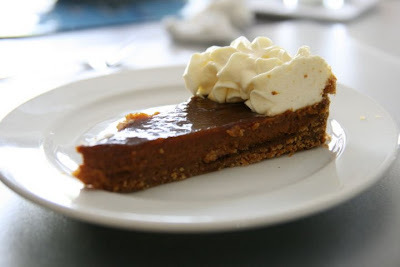 This was my piece de resistance and now that we're three months into the year, I'm craving a piece of pumpkin pie! The graham cookie, the thick swirl of cream, this is not the season of indulgence I know but oh, I'm missing the snow, the Christmas carols and the happy getogethers. No prizes for guessing my favourite holiday. There, in all it's juicy pink glory. I'm just impressed that she went to buy a piece of meat. See what love can do? 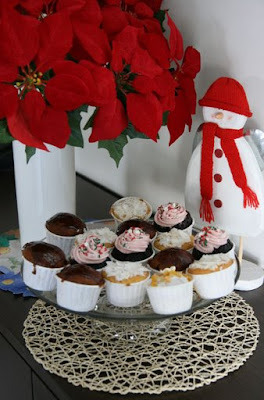 One more picture of my little cupcakes, just because D's Christmas ornaments were so very cute. 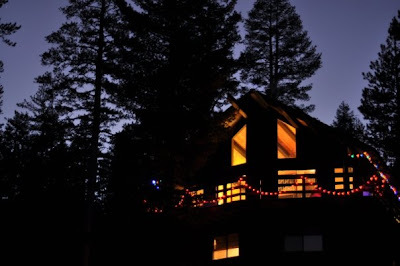 I miss gingerbread houses and charming Christmas ornaments of wood and felt! 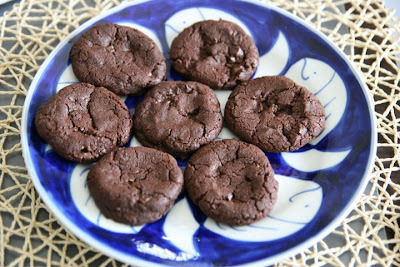 And now Dorie Greenspan's famous World Peace dark chocolate cookies, so-named by Pierre Herme because if the world could have them, there would be peace in the land. (Which is a perfect sentiment for Christmas, I must say). I have her cookbook but it was in D's kitchen that she unrolled the dark chocolate dough with its meltingly good chocolate pieces. The guys were picking them like hot potatoes off the baking tray! This cookie recipe is an absolute winner! Remember to use the best quality dark chocolate and sea salt that you can find. 5 ounces (150 grams) bittersweet chocolate, chopped into chips. 3. Pour in the flour, drape a kitchen towel over the stand mixer to protect yourself and your kitchen from flying flour. 4. Continuing at low speed, mix for about 30 seconds more, just until the flour disappears into the dough — for the best texture, work the dough as little as possible once the flour is added, and don’t be concerned if the dough looks a little crumbly. Toss in the chocolate pieces and mix only to incorporate. 6. Preheat the oven to 325°F (160°C) and bake the cookies one sheet at a time for 12 minutes — they won’t look done, nor will they be firm, but that’s just the way they should be. Transfer the baking sheet to a cooling rack and let the cookies rest until they are only just warm, at which point you can serve them or let them reach room temperature. 7. Serving: The cookies can be eaten when they are warm or at room temperature. I prefer them warm and melty! Packed airtight, cookies will keep at room temperature for up to 3 days and can be frozen for up to 2 months. They can also be frozen in log form for months, then sliced and baked when guest arrive unannounced! This past Chinese New Year, we decided to take a break from family meet-ups and steal a trip away to San Francisco. 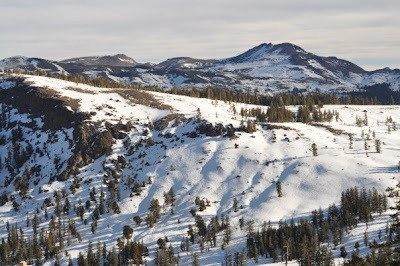 Primarily, we went to visit my old housemates in the Bay Area and to go skiing in Tahoe. I had been stressed out at work and needed to get away. It was refreshing, relaxing, no, more, it was liberating to be back, to walk around the streets of San Francisco knowing nobody and caring less. 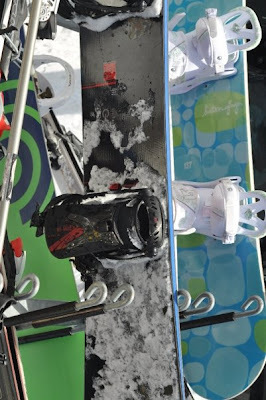 It was wonderful to to be skiing in the refreshing cold, rushing downhill at a speed that took your breath and thoughts away. The mountains were more beautiful than I had remembered them from before and yes, I suppose I actually do miss the California winter! 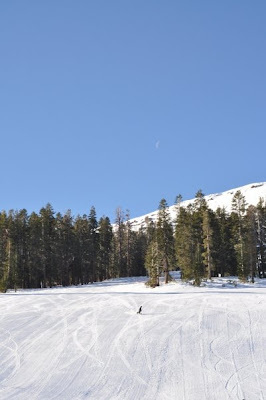 After skiing, we headed back down toward San Fran. I ate some good food, not that much becuase it was a simple holiday spent with friends. We were lucky to have J. and W. host us in and the first place I discovered was where we went to dinner our first night in the City. I would highly recommend dinner at Frascati's in San Francisco, it the most warm and delicious Meditaranean-French food I've had in awhile. Their halibut melts in your mouth and the pasta, combining the unlikely elements of pesto and seafood, is quite masterful. We stayed with our gracious hosts near the Golden Gate park and over the next few mornings, we would walk down to the sidewalk cafe Park Chow for some lunch sandwiches and pasta, then sit in the sun for awhile or walk into the gardens. A walk round to the beautiful academies and giant redwoods of the park was always a good way to start the day. On other days, we ate Mexican food in the Mission, visited their favourite Mitchell's Ice Cream Parlour and paid a nostalgic trip to Swan Oyster Depot, a Nob Hill institution- this tiled bar and boasts the freshest oysters and yummiest sourdough bread I've had in my life! The second fantastic food recommendation would be the San Francisco Ferry Terminal Farmers Market, which we visited on Saturday morning. I had been here before but never on a Farmers Market day and that is really key. There are excellent stores inside the terminal which are permernant, like Cowgirl Creamery and my all-time crush, the Miette Bakery, with their organic cupcakes, tangy lemon cake and take-my-breath-away vintage-inspired layered cake goodness. But the farmers market is not to be missed. Of course, it helped that the weather was so darned perfect but the stalls are a collection of the Bay Area's best producers and farms. There were rows and rows of storea and most, like the Bluebottle coffee stall, Roti rotisserie chicken sandwiches and griddle cakes are only there on lip-smacking market days. I wish I could show you the mountains of brussel sprouts, wild mushrooms, chunky asparagus and in-season artichokes, I swear they were so fresh they wafted butter. Of course, I couldn't control myself and bought a bottle of cider, two boxes of cupcakes, a bag of huge wild mushrooms and a loaf of Acme olive bread for the hiking. After San Francisco, we drove along the coast to go whale-watching and hike along the Marin coastline with friends. Apart from beautiful scenary, we also had some awesome catfish & chips, served warm and crispy in the chilly coastal air. Then, it was time to south, back to the old school. It felt like going home. The third food event was Chinese New Year dinner so I guess it's fitting that it felt like home. My celebrations here were actually a little muted but given that a bunch of old friends congregated at the house in Menlo Park to prepare dinner together, it was truly a festive and spirited reunion. 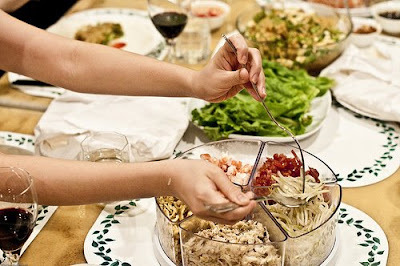 I guess the way we celebrate, with friends and food, is very reminiscient of exactly how we were before. I had brought the Lo Hei ingredients and with our Mexican, Hawaiian, Malaysian friends, it was the most merry and messy Lo Hei I'd had in awhile! Everyone was so excited, least of all M. who gamely volunteered to make Kueh Lapis Beras and refused to be swayed by our sceptical commentary. 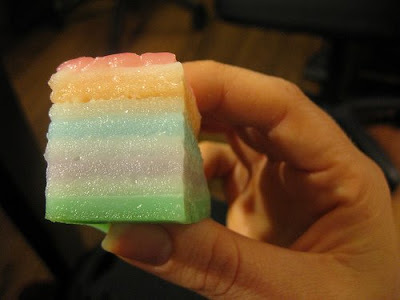 She and K. stirred, coloured and steamed the layers in a makeshift steamer and guess what, their belief totally paid off with very pretty pastel kueh! Yesterday I had the pleasure of hanging out with a little girl and although she fussed when I stopped singing to her, I had a great time watching her watching me! It made me think of times we had had before she was born and the baby shower that awaited her arrival, which was held at D's house at the beginning of the year. How time has flown by! The picture above is of the clever name tags that guests were given to write and wear on their sleeve. The first kudos definitely has to be given to Eileen from Eta Sweets. There are relatively few home bakers making macarons in Singapore and she is definitely one of those with a lot of baking background and style. Take a look at her site here and you'll see what I mean, it's all home-spun loveliness. She made a lovely batch of mini macarons, packaged them into little acetate containers and wrapped them with ribbon to match the colour theme (pink and green) of our party. She was such a joy to work with and her mini macs were take-home favours for all the ladies. 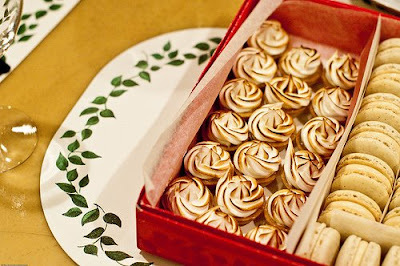 I made a lemon meringue pie and red velvet cupcakes and D. unveiled a chocolate crocombouque from Deste that was really yummy, filled with cold chocolate ganache and drizzled with spun sugar strands and gold foil. 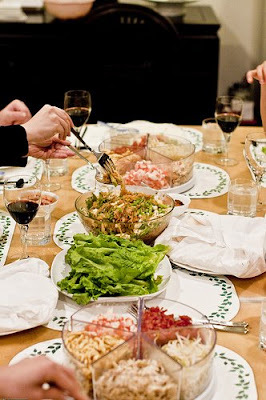 We had a tablefull of food for tea, savory foods like cherry tomato bruschetta and curry puffs and more sweets. It wasn't till later that I realized most Singaporeans don't practice this concept of a baby shower, but it's such a lovely reason to get together to celebrate! The most frequent question I was asked was what do people do at a shower? Well, eat of course, since this is Singapore but also share stories, play games and open presents, which are another good way for friends to help the mother-to-be cope with the swag of various baby equipment and salves that she will shortly need. The two particularly hilarious games we played were one where guests used a ball of twine to guess the mother's waist circumference (experienced mothers definitely had the upper hand in this one) and another where we guessed the individual features (mother's or father's) that the mother was hoping for her child. The winners were given little tins of T2 green tea from Australia, tied with pink ribbon! I often get asked my favourite place for dim sum and it is far and away this place, the Crystal Jade Golden Palace at Paragon. The first reason definitely has to be the location- much as I never go to to Orchard Road anymore, there's nothing quite like a Sunday stroll down that stretch to feel like you're "going out". 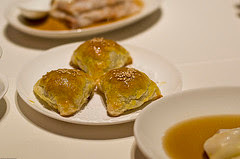 The restaurant is actually a Teochew one but they do many Cantonese styles of dim sum. I find their menu fairly wide, though perhaps not as extensive as Lei Garden. 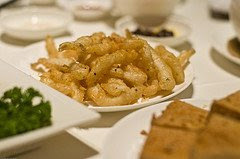 On this particular day, we had the favourites, har gao, siew mai, charsiew and rice rolls type dim sum, as well as some more interesting ones, like the battered and fried silverfish, fried tofu and a banana prawn pancake. 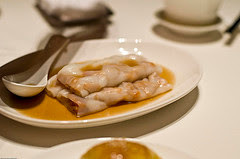 I find the refinement in the cooking and thin but supple wrapper skins the best at this location. 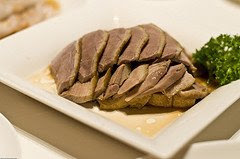 They also have the regular soups and more substantial dishes like stir-fry vegetables and an excellent braised goose and soft tofu, so it tends to be a comfort food-type location. 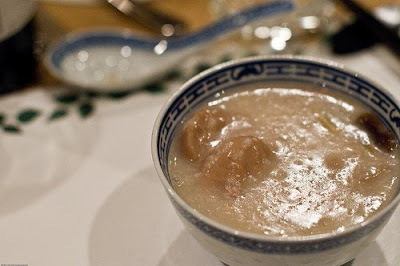 My favourite dish is the teochew fresh fish porridge, unlike regular porridge, this is a watery porride served in a beautiful clear broth, steamed with white pomfret and heaped with delicate sprigs of cilantro, slices of ginger and crispy salt fish. 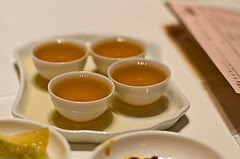 At the end of the inveriably heavy meals, you are served a cup of bitter chinese tea, to "wash" away the oil.